Everything and a lot more is findable on Google, isn’t it? The National Library of Malta houses some of the world’s most precious books, and yet, until not too long ago, very little had been done to preserve and share this unique heritage, a collection of archives and manuscript pieces showcasing the country’s history, dating back 700 years. The books have been left for too many decades – centuries even – to decompose in situ, untouched, on their shelves. That’s right, this means that as of today, jewels such as the Encyclopédie, ou Dictionnaire raisonné des sciences, des arts et des métiers, a 28 volume series published in France between 1751 and 1772, is currently crumbling, moulding, detaching page by page from its hand bound spine; literally dying. And sadly, more than 700,000 world heritage books are currently sentenced with the same death threat. Through the eyes of a bibliophile, this might as well be called genocide. This just can’t be right, right? The good news is, this process can be reversed, if action is taken now. New Leaf, a non-profit organization, has recently launched a restoration programme of the books housed at The National Library. Page by page, book by book, with methodical patience, passion, expertise and care, dedicated individuals are re-pulping pages, hand binding them with the utmost respect of traditions, and then digitising them to share this incredible knowledge collection with the world. A single book may take from a few hours up to two months of work to come back to life. How many of them again? 700,000? If you wish to get involved, several things can be done. Spread the word to raise awareness of those forgotten books. 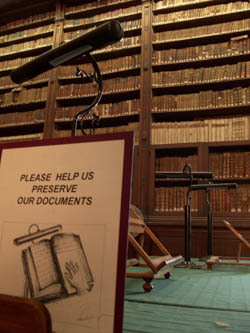 Visit the National Library – chances are that you have not been there in well over 10 years. Look at these shelves with a new eye, think of all the knowledge currently going up in a cloud of dust. Expect fascination from the sight; expect to feel outraged from the decrepitude. Donate. New Leaf has set a donation box in the main entrance hall of the Library; every penny counts and contributes to the purchasing of specialized equipment. New Leaf is actively looking for help. Human help. A tremendous number of hours will be devoted to entering the National Library’s hand written cards into a database. Books and manuscripts need to be cleaned. Out-dated cassette based audio books need to be converted to MP3s. The scope of the task goes beyond imagination; yet with vision, support and involvement, the books can be saved, one at a time. @LightBulb, the National Library is the archive library, not the general reading library. Hence our omission of the directions – it’s bang in the middle of Valletta anyway. However, given your cue, we’ll add the info as it’s always helpful. Enjoy Singapore, and think of us in Malta! With the passing of the months, your time here may seem rosier! I got an idea how about including directions to the library ( whoa, genius ) with the street address, hours, bus links, different branches and other information like if book are available in English. A wonder why this place is even allowed to be part of the European Union – ridiculous, sure makes me want to invest in helping the project … feels like a third world country to me but maybe those type nations even have more details about things accessible, forget it anyway because I plan to leave for Singapore. Yes, I know, it was just the first line or so that might resonate that way. Though I can’t say I read it that way at all. The more on board the better in these kind of things. All pulling the same way to get a job done. Laudable. @ Elizabeth: I was in no way criticizing New Leaf! My comments were directed at the first part of the article. I can see you might read the article that way, perhaps dwelling on the phrase ‘…until not too long ago..’ but I don’t think it was intended as you interpreted it. In fact, in the context of hundreds of years, then the efforts at restoration would be ‘recent’. My feeling is that the author and New Leaf initiative intend to help galvanise public awareness to boost the work already being done by whatever bodies and to give it a fillip – financial and in terms of time. I note that on the New Leaf board is someone who is National Librarian and Chief Executive Officer at Malta Libraries. So clearly New Leaf is working hand in hand with the officials, as it would have to. While I’m so happy about this new and fresh initiative, I think the first part of the article is unfair on the Library’s restorers who have been doing excellent work for many years. It is also unfair on other individuals and entities who have already been contributing in restoring books at the Library.